Nicholas Latifi has topped day two by setting the pace in this morning's test session at the Bahrain International Circuit, stopping the clock at 1:40.541 in the second half of the session to top the timesheets ahead of RUSSIAN TIME teammates Luca Ghiotto and Artem Markelov, while the afternoon was given over to race simulations, with Nyck De Vries topping the timesheets on 1:41.212 ahead of Gustav Malja and Charles Leclerc. The day opened to gloriously sunny conditions, with the drivers heading out on their medium Pirelli compounds as soon as the lights went green. Johnny Cecotto set the early pace, stopping the clock at 1:41.371, four tenths faster than teammate Nyck de Vries. 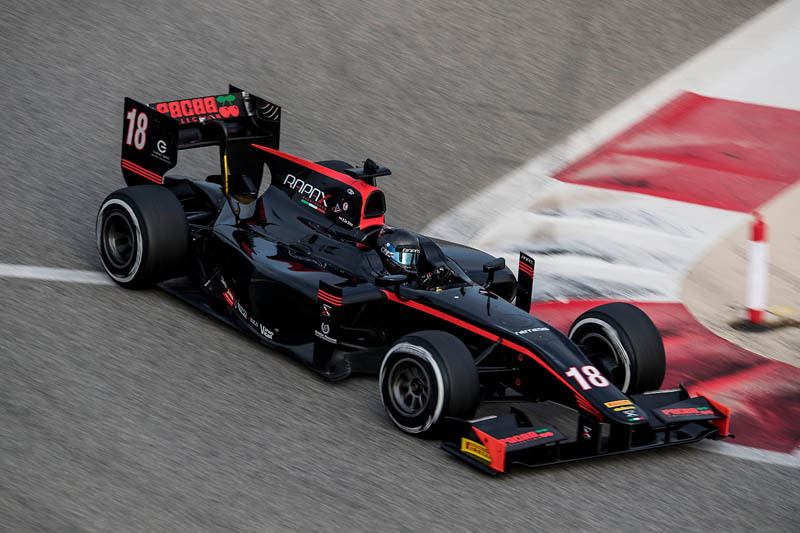 After a brief red flag Markelov hit his pace, but Ghiotto was the first man to break the 1:41 barrier, followed soon after by Leclerc and Norman Nato. Just after the halfway mark Latifi grabbed P1 with his blistering lap on soft tyres, a tenth quicker than Ghiotto, and his rivals were unable to challenge. In the final hour a number of drivers tried different set ups to grab the top spot, but to no avail: Latifi owned the morning session when the chequered flag was shown. Following a two hour break, the action resumed with the field mainly focusing on race simulations and pitstop practices. Sergio Sette Camara set the pace until Cecotto improved on the Brazilian's laptime to go P1. With one hour left in the day, Camara reclaimed the top spot dipping under 1m42, before Malja also found some extra pace to move up to P2. Fifteen minutes later, de Vries blew past them all with a time good enough to be the afternoon's fastest man. After the chequered flag, Camara's car was found underweight. Therefore, the MP Motorsport driver had all times deleted from the results, promoting Leclerc to the top 3 finish.